Connectivity is driving the development of ever more sophisticated technology in the offshore oil & gas sector. The so-called Digital Oilfield concept harnesses satellite connectivity to drive safer, more efficient, more environmentally friendly and, in the end, more profitable operations. Around the world, on the ground and in the air, consumer electronic devices such as smartphones, e-readers, tablets and laptops, consume more and more bandwidth, placing increased demand on satellite connectivity and infrastructure. There seems to be some confusion as to whether the overall satellite FSS industry, which includes the ‘big six’ satellite operators (Intelsat, SES, Eutelsat, Telesat, SkyPerfect-JSat and Optus), are likely to flat-line over the next few years, or whether there remains prospects for growth. 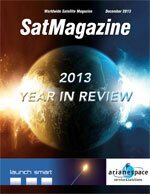 At the time of writing, it is predicted that we will see 192 spacecraft launched with 81 launches. As to their purpose, the following table provides a break-up. No, I am not rewriting the Chinese astrological calendar, and it is still officially the Year of the Snake. However, in a satellite and broadcasting industry that is under highly disruptive change, I do wonder what the New Year will bring to us all. On October 31st, the Federal Aviation Administration created a loud buzz among airlines and airline passengers with their approval for the use of personal electronic devices below 10,000 feet. The Satellite Industry Association has recently released an updated version of its 2013 comprehensive study of satellite industry data. This 2013 report, performed by The Tauri Group, looked at over 80 key companies worldwide—including all SIA members—and added market analysis and financial reporting to publish an in-depth analysis of the industry. Guido Baraglia, Board member of the Satellite Interference Reduction Group (IRG), discussed the current state of interference and the latest initiatives with SatMagazine. Mr. Baraglia, the Director at SAT Corp. (a KRATOS company), is a leading expert in Carrier Monitoring and Interference Geolocation, with more than 20 years of experience in combating RFI affecting telecommunication satellites. He’s participated on panels at SAT 2013, CabSat 2013, the WBU-ISOG conference in Geneva, ITU workshops and is a referenced source on RFI mitigation. Companies today must re-assess their talent needs in order to remain competitive and drive growth. The satellite communications industry faces challenges all the while remaining ripe with opportunities. Employers must ensure they obtain a “great hire” to continually further ongoing business success. The early years of the U.S. space program were challenging, stimulating, memorable, and even, on occasion, humorous. Gather any vets of those programs for a lunch or happy hour and the fun tales emerge. For the information and communications technology omnivore, the annual Pacific Telecommunications Conference in Honolulu early in the New Year always offers a feast of new perspectives, new opportunities and new business associates as well as friends to meet.